Wieden + Kennedy knows Super Bowl ads. In the agency's 34-year history, it has worked with 15 clients to create Big Game-worthy spots. On Sunday, W+K will air its 50th Super Bowl commercial—though it's hard to determine which ad comes in at No. 50 as the agency is producing for both Bud Light and TurboTax. 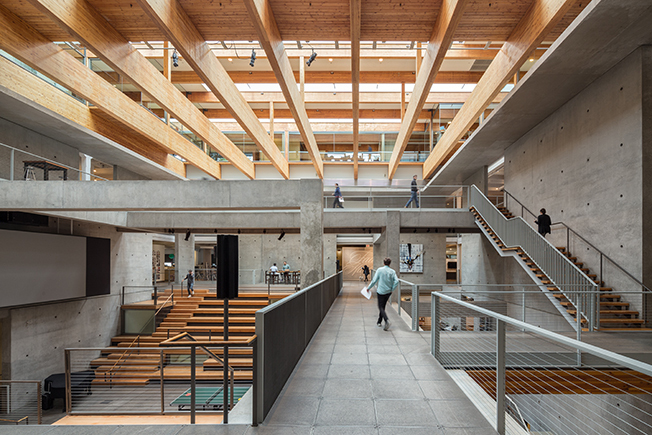 Although W+K boasts eight locations around the globe, it's most famous for its original office in Portland, Ore., which houses 600 employees and about 30 dogs. But the agency's size doesn't detract from the intimate and welcoming vibe of the space. "Dan [Wieden] and David [Kennedy] really envisioned W+K as a physical space first and a company second," said W+K Portland ecd Mark Fitzloff. "A place where people could come do the best work of their lives. So we really see the building itself as an important contributor to our success. It inspires creativity without getting too precious for its humble Oregonian roots." The eight-foot tall Beaver Story sculpture greets visitors in the agency’s lobby. The photos on the wall are portraits of Portland office employees. A similar wall is in each of the agency’s eight offices around the world. Both murals were created by W+K 12 classes. W+K 12 is the agency’s in-house ad school. The black-and-white mural is a tribute to Lou Reed created the night the singer died. W+K’s family-friendly policy is evident everywhere. This custom wallpaper made by an agency creative lines the walls of one of the shop’s four breast-feeding rooms. The mural is one in a collection of three that Brooklyn-based art duo Faile created for the agency’s Founders Day in 2006. “The Work Comes First” is a common refrain around W+K. The permanent installation memorializing the mantra is one of the agency’s “Wiedenisms,” along with the famous “Fail Harder,” that W+K popularized. The Nest is the meeting area on the sixth floor. It’s made entirely of wood branches—mostly willows—that came from a nearby forest preserve. This story first appeared in the Feb. 1 issue of Adweek magazine. Click here to subscribe.